Audi's player in the rapidly expanding entry-luxury segment is the sub-$30,000 (not including destination charges) A3 sedan. At that price, you get a car you'd actually want to drive. Both sporty and welcoming, the 2015 Audi A3 and higher-performing S3 are small, but also a solid value and a pleasure to live with. It has a smooth ride and is great on gas. My vehicle is comfortable and has a smooth ride. It requires little maintenance. I have the navigation system as well and it is a little off in its directions in certain locations but it is only off by a little bit. Sound system is a great and I like that the CD player is in the glove compartment since I do not use it often. Gas mileage is also very good and reasonable. One thing that I would adjust is when the tire light comes on saying my tire is low in air it doesn't always specify which tire. I have to go through each tire myself and see which tire needs it. I also feel like it is difficult to see out the back window when I am reversing. The back window seems narrow. I have owned a lot of cars though and this car is my favorite and I will continue to buy. Rides very smooth, great on gas. Love that the screen goes down once car is off. 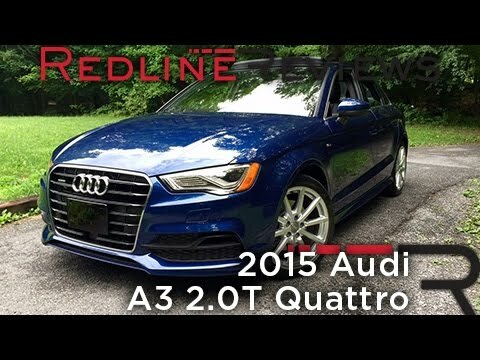 My 2015 Audi a3 is great. Rides very smooth, is very great on gas but I do have problems with it either leaking or burning oil quick. I used to have a 2012 Audi a4 before this one and had the same problem with the oil leak. I love how the seats can be adjusted just the way you want it with even back support and the headrest can be adjusted as well. You or you passenger will never be driving uncomfortable. Door lock automatically once you start driving and unlock once you put the car on park. Also if the passengers door is open and you try to drive the car automatically put the emergency break on. I love my car just wish maintenance wasn't so pricey. Audi a3, wonderful handling and fun to drive, this car offers the whole package. This car is for driving. It is super responsive, gas, break, this can cause some jerkiness but once you get to know the car you will overcome that. It is a small car but I am able to carry a good amount with me. I wouldn't recommend for a family car. It also takes 89 at the gas pump which is a little pricier but guarantees better performance. The car has such a smooth ride, it beeps when you surpass 80mph. I haven't had any issues with it so far and I have had it for almost a year. Another fun feature is the car will make a loud noise to remind you if you forgot to turn off the lights (if you choose to do manual, the car has a auto feature). Volkswagen Group of America, Inc. (Volkswagen) is recalling certain 2015 Audi A3 1.8T FWD S tronic and 2.0T Quattro S tronic vehicles. The safety certification label has an incorrect vehicle production date. As such, these vehicles fail to comply with the requirements of 49 CFR Part 567, "Certification." In the event of a vehicle safety recall, an incorrect production date may prevent owners from determining if the recall affects them, increasing their risk of injury or a crash. Audi will notify owners, and dealers will install an overlay label containing the correct vehicle production date, free of charge. The recall June 23, 2017. Owners may contact Audi customer service at 1-800-253-2834. Volkswagen's number for this recall is 51F5. Volkswagen Group of America, Inc. (Volkswagen) is recalling certain model year 2015-2016 Volkswagen Golf, Golf SportWagen, GTI, Audi A3 sedan and A3 Cabriolet vehicles. Due to a problem with the suction pump inside the fuel tank, fuel may flow into the evaporative emissions (EVAP) system. As fuel accumulates in the EVAP system, it may leak out through the charcoal canister filter element. A fuel leak in the presence of an ignition source increases the risk of a fire. Volkswagen will notify owners, and dealers will replace the suction pump, free of charge. The recall began November 2016. Volkswagen owners may contact Volkswagen customer service at 1-800-893-5298, Audi owners may contact Audi customer service at 1-800-253-2834. Volkswagen's numbers for this recall are 20Y6 and 20Y5. Volkswagen Group of America, LLC (Volkswagen) is recalling certain model year 2015 Audi A3 Cabriolet vehicles manufactured June 5, 2014, to April 1, 2015. The affected vehicles have a driver or front passenger seat whose cover may be incorrectly stitched, preventing the side air bag from properly deploying in the event of a crash. Improper side air bag deployment may increase the risk of injury in the event of a crash. Volkswagen will notify owners, and dealers will replace the driver's and/or front passenger's seatback cover, free of charge. Owners were mailed interim notices on February 4, 2016. The recall began on February 29, 2016 . Owners may contact Audi customer service at 1-800-253-2834. Volkswagen's number for this recall is 74C9. Volkswagen Group of America, Inc. (Volkswagen) is recalling certain model year 2015 Volkswagen Golf, and GTI manufactured on February 17, 2014, to May 22, 2014, and Audi A3 manufactured on February 16, 2013, to April 23, 2014. Improper nickel plating of components within the fuel pump may result in the fuel pump failing. If the fuel pump fails, the vehicle will not start, or if the engine is running, it will stop and the vehicle will stall, increasing the risk of a crash. Volkswagen will notify owners, and dealers will inspect the vehicles and replace any affected fuel pumps, free of charge. The recall began on June 16, 2015. Owners may contact Volkswagen at 1-800-893-5298 or Audi at 1-800-253-2834.